Vintage Postcard Gallery: Happy Birthday Elvis! 8th January, 2010, would have been Elvis Presley's 75th birthday. Whilst fans all over the world are listening to his music and watching his movies, I wanted to join the millions of other bloggers saying Happy Birthday to the King with this vintage postcard. 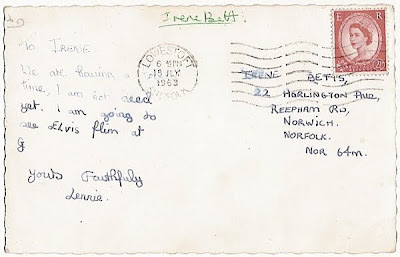 Published by Star Pics, this postcard was posted on 19th July, 1963 from Lowestoft in the United Kingdom, presumably, judging by the handwriting, from a very young Elvis fan. The black and white photo of Elvis is a promotional shot for the movie Blue Hawaii, taken by rock music photographer Michael Ochs at Paramount Pictures in Los Angeles, California on 1st April, 1961. Curiously, the image appears to have been printed from a flipped negative. Many thanks to my "Little Sister" Jac - a fellow Elvis fan - who owns this postcard! Find more vintage postcards at Marie's Cpaphil Vintage Postcard Blog and join other collectors on Postcard Friendship Friday. Today her post is entitled "God Save the Queen" so this post about a "King" seems to fit very well! Ah, that wonderful handsome face. This is a knockout of a card! I didn't even know that it was Elvis' birthday today! 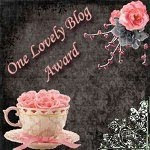 I'm going to turn on a cd right now:) Wonderful post! Elvis was one of a kind. I wonder how many Elvis postcards there are. New ones keep coming out still. Thanks for sharing your post card. I will now be on the look out for Elvis Post card. Okay - I just had to comment again. The word verification is "potti" and I couldn't pass it up. Talk about a blast from the past! Wonderful card. Happy PFF! There was no one else like him. That is a wonderful postcard. The Aware goes to this post for "most original use of theme". On New Year's Day, I attended the Rose Parade in Pasadena, and there were lots of awards like this at the Rose Parade. Happy PFF! Thanks to your sister for sharing ! 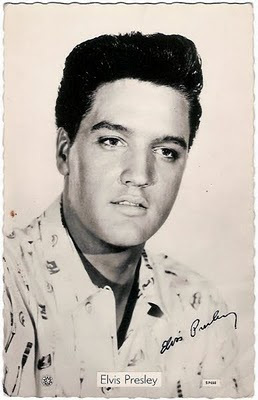 My mom is a huge Elvis fan; I love his music and his movies are so much fun... Thanks for sharing! I remember going to see Blue Hawaii! How that does date me. :( It must have been one of the first, if not the first, time I was allowed go with a friend. I was so excited. We renewed our wedding vows at Graceland Wedding Chapel in Las Vegas!!! Performed by "elvis"! thank you all so much for your comments! am thrilled elvis excited so much interest! What a great card of Elvis.